My battle with the Russian language has been going on for eight years, and is far from over. I was 56 when it started. My family were Russian, Jewish on my father's side, Christian on my mother's. The Skidelskys were "oligarchs" of the far east before the Revolution: my father was born in Vladivostok on the Pacific coast. One of my mother's ancestors, so family legend has it, had been signed up from Germany as a skilled workman by Peter the Great, and had prospered modestly. Both sides of the family had prudently left Russia in 1918. None of this meant I spoke Russian. I grew up in England and my parents spoke English to me. They did not think there was a future in Russian. I did not offer to learn it and my English boarding school did not offer to teach it. My one natural advantage proved to be a mixed blessing. I knew how Russian sounded. My first achievement in the language was a good accent. Bluffing my way in Russian proved easier than learning it. I am often asked "Why did you want to learn Russian?" There is no single answer. The fall of communism had opened up the chance to reconnect with my roots. My first visit to post-communist Russia early in 1994 was a research trip for a book I was writing on "the world after communism". I met most of the economic reformers, including Yegor Gaidar, Yeltsin's first prime minister. But I think the real inspiration came from meeting a remarkable dissident couple, Lena Nemirovskaya and Yuri Senakossov. Shortly before, she had started her "school for democracy", the Moscow School of Political Studies, and asked me give a talk to her Russian students. I desperately wanted to communicate with them in Russian; and I also wanted to talk to Yuri, who spoke no English, about Russian philosophy. Above all, I fell in love—as so many have—with the Russian language, with its sensuous, lyrical quality. It just sounded beautiful to me. My early forays were too spasmodic to succeed. I was doing far too many other things to concentrate on learning a new language. My first teacher was Olga, a physics researcher whose institute in Siberia had gone bankrupt. She and her husband Alexei, a mathematician, had moved to London, where she supported herself by giving Russian lessons. But she was not a language teacher. Her marriage was on the rocks and she wanted to talk about this. She had also developed a passion for my eldest son Edward, then still at Oxford, and wanted to talk about this too. Russian lessons with Olga became an incidental adjunct to the unfolding of a complex personal drama, unfortunately in English and accompanied by much weeping and whisky. "But do you like him?" I asked. "No, I can't stand him." "But why don't you tell him to leave?" "But, he has nowhere to go." "You could call the police" I suggested. "Polis?" she said, suddenly alarmed. "Why don't you buy him a return ticket?" "We did, but he sold it." Eventually they packed his bags, left them in the street outside and changed their flat key. But he took up residence under the stairs in the hall and banged on their door all night, so they had to let him back in. It seemed a very Russian story to me. In the summer of 1996 I spent two and a half weeks living with a Georgian family in Moscow. My son Edward was now in town and shamed me with the progress he was making in Russian. Every morning I had a two-hour lesson with my new teacher Valentina. She pronounced my linguistic foundations to be very shaky and started me on unit 1 of an old-fashioned Soviet text book. I worked conscientiously—there was nothing else to do—and felt I was making progress. Then I came back to England and it faded away. Short periods of immersion are no good, continual reinforcement is needed. The late 1990s were linguistically disastrous. I was finishing the third volume of my biography of Keynes, being an opposition front bench spokesman in the Lords and trying to salvage the Social Market Foundation from bankruptcy. By 2001 I was free of all these commitments and the road to Russian was open again. It started that spring with my renting a flat in Moscow for two months. My new teacher Masha, inherited from Edward, spoke no English and so I was forced to speak Russian with her. It was my first big breakthrough. But it was hard work, and I spent much of my time in despair. In retrospect I realise that my method was not really efficient. I should have lived with a Russian family, and let more of the language sink in by osmosis, but I was too jealous of my privacy. Edward had spent several months living with Masha and her aunt, which was excellent for his Russian, but led to another unrequited passion. The Russian language is very logical. Russians are a very logical people: but their logic is often based on mad premises. It is built up of complex and subtle variations on root words (imagine a tree trunk with masses of branches and leaves). This makes it highly contextual. To learn its structure and vocabulary in the abstract is a heartbreaking business. And my memory was not what it was. Luck now took a hand. At Lena's, I ran into the actor Ralph Fiennes, who was also—more briefly—in Moscow for a total immersion course. From dawn to dusk he never moved without a bevy of Russian ladies at his side. 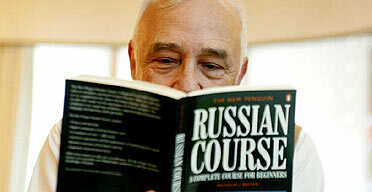 They had been supplied, he told me, by his Russian teacher Frank Althaus, who ran a Russian language school in London. I started private lessons with Frank in September 2001. These meandered on, when I had the time, through 2002. There was a month in Moscow and St Petersburg with Frank's regiment of Russian ladies: Oksana, Svetlana, Olga, Natasha. During this time I developed a new method: I would build up my vocabulary by accumulating a stock of cards, the size of visiting cards, with the Russian word on one side and the English word on the other. For months I never ventured out without my precious cards, held together by elastic bands. I would wander down the long corridors of the House of Lords, cards clutched in my hands, muttering away like a lunatic. I imagined them saying "Skidelsky, completely off his rocker, sad case really..."
But it was not enough. I must have a definite goal to keep working. In October of 2002, I announced to Frank that I would take Russian A-level the following summer, and that he would be my teacher for it. I registered for the examination, set by the Edexcel "Success through Qualifications" exam board, at Campbell Harris Tutors in Kensington High Street. As a private student, registration cost £250. There would be six papers altogether, including one called Prescribed Topics and Texts. I was happy to discover that my qualification, if I got it, would improve my employability, particularly with companies which had international branches. I met with Frank for two hours a week for much of the next seven months. At first we concentrated on my set text, Chekhov's Uncle Vanya. I went to every Chekhov play on in London and Moscow; we had an Uncle Vanya play-reading at home, we prepared answers on all the characters. It gradually dawned on me that in other parts of the examination I would face a technical hurdle undreamt of by the wicked examiners when I last took A-levels almost 50 years ago: "You will listen to five to six minutes of recorded material... You will have individual control of the recording and may stop, rewind and replay the recording as you wish..." This was alarming: I am a technophobe, and imagined all sorts of disasters with the rewind and forward buttons. There were other little niggles: my vocabulary was both better and worse than that required, and my grammar less careful. So panic increased as the date drew nearer. On the basis of mock papers I did with Frank it seemed I was heading for a B. I would do well on the Prescribed Topics and Texts, but be marked down for language. My despair became almost total when I turned up in May of this year for the oral examination, held at a hotel in Russell Square. This "tests your ability to argue and to cope with spontaneous discussion in the target language". I noticed the Christian names of the candidates: Olga, Tamara, Alexandra, Evgeny, Ekaterina, Nicolai —Russian to a man (or woman). It seemed inconceivable that any of them would get less than 100% on this, and indeed the other, papers. Official figures showed that about 500 students took Russian A-level in England each year. How many, of them, I wondered, were Russian? If my sample was anything to go by, it must be close to 100%. What chance would I have? I was reassured by the Prescribed Topics and Texts. I was required to write 200 words in Russian on the character of Serebryakov—a pompous, complaining professor—in Uncle Vanya, which I had prepared well and remembered most of; and, for the topic, something on Russian unemployment. I wasn't that pleased with the Russian script I managed, but I felt confident about the topic itself, since I not only taught in a university economics department, but had discussed the Russian economy endlessly with Russian reformers. I wrote learnedly (I thought) about the problem of hyperinflation, lack of a rule of law and the wrong people being in the wrong jobs. B turned out to be right, but with an unexpected twist. On my five language papers I was comfortably above A grade. But, to my surprise, I was adjudged to have failed Prescribed Topics and Texts, scoring a miserable 26 out of 90. So I fell a few marks short of my A. "A clerical error, it must be," said family and friends, and I decided to appeal. Not at all: the fail was confirmed, though I was given a few extra marks. It was not the language the examiners minded, but my "lack of knowledge and understanding of the subjects, my inability to develop a coherent argument, and irrelevance". Eventually, Campbell Harris received a letter from appeals officer Joanne Hirst, written in the kind language reserved for hard-working, but slightly dim students: "I note that Robert is dissatisfied with his result in this unit. I cannot accept, however, that the candidate's own assessment of his performance is sufficient to cast doubt on the accuracy of the assessment of the principal examiner." I couldn't help but take comfort from Keynes's remark on hearing the results of his civil service examination in 1906. "Really, knowledge seems an absolute bar to success," he wrote to Lytton Strachey. "I have done worst in the only two subjects of which I possessed a solid knowledge, mathematics and economics." But I have not given up hope. Linguistically challenged though I am, I still aspire to scale higher peaks in the Russian language.